The Two Brothers of Verona | Santé Food.Wine.Spirits. Verona is located in Northeast Italy’s Veneto region. It is renowned as the setting for Shakespeare’s Romeo and Juliet and it is also the backdrop for his comedic play, The Two Gentlemen of Verona. 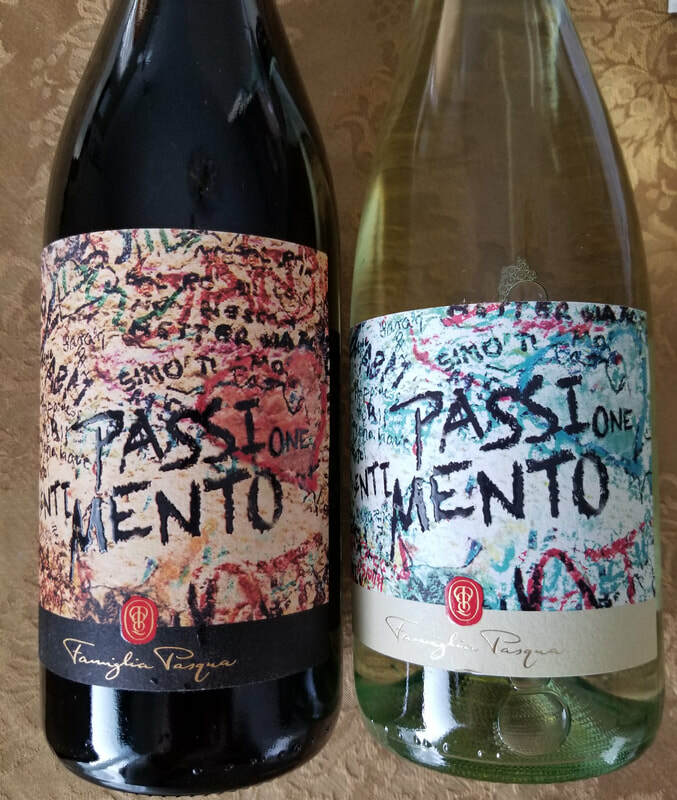 What comes to my mind however when thinking of Verona are “the two brothers of Verona” Riccardo and Alessandro Pasqua, representing the third-generation of Pasqua Vigneti é Cantine. Over the course of a three-hour luncheon, Riccardo and Alessandro shared their passion, enthusiasm and dedication for winemaking that was clearly expressed in the fabulous wines I tasted. This dynamic duo was born and raised in Verona and they are a force to be reckoned with. Not only do they share an impressive business acumen, but they are also quick-witted, have a strong work ethic, a great sense of humor and they love and live life to the fullest. 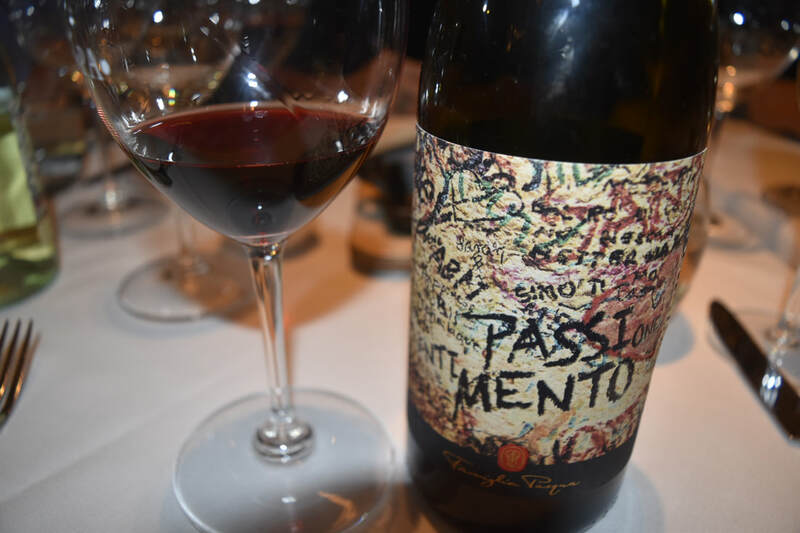 The history of Pasqua Vigneti é Cantine began in 1925 when the first generation left their home in Apulia for Verona to embark on a new business. Going from the wine and retail trade to becoming a winery, they acquired new vineyards and made affordable table wine, making Pasqua a household name. The second generation, led by Umberto Pasqua, joined the company in the 1960s opening doors for exportation, establishing innovative research for vines and grafting techniques. In the mid-2000s a new headquarters and manufacturing plant was established in San Felice, located in the heart of the family’s vineyards. It is an environmentally friendly, gravity-fed winery complete with cellars, a laboratory and temperature-controlled warehouse. The winemaker is Giovanni Nordera, a cousin of the family. The winery produces approximately 14-15 million bottles of wine per year! The third generation made their entrance in 2007, beginning with Riccardo who had a vision for expanding Pasqua’s market. With the support of his father Umberto, Riccardo along with his wife and children moved to New York City in 2009 and created Pasqua USA LCC. Within just a few short years and hard work, the revenues allowed Riccardo and Umberto to buy out the other family members, which was finalized in 2017. In 2014, Riccardo’s younger brother Alessandro became Vice President of Americas and moved to NYC taking over Pasqua USA, LCC. Riccardo returned to Italy a few weeks later to handle the day-to-day management of the company. Riccardo became CEO of Pasqua in 2015. 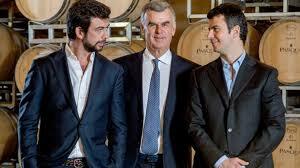 Umberto is President of Pasqua and he and his sons Riccardo and Alessandro remain co-owners of Pasqua Vigneti é Cantine. The Veneto wine region has a variety of diverse microclimates, soils and indigenous grapes. 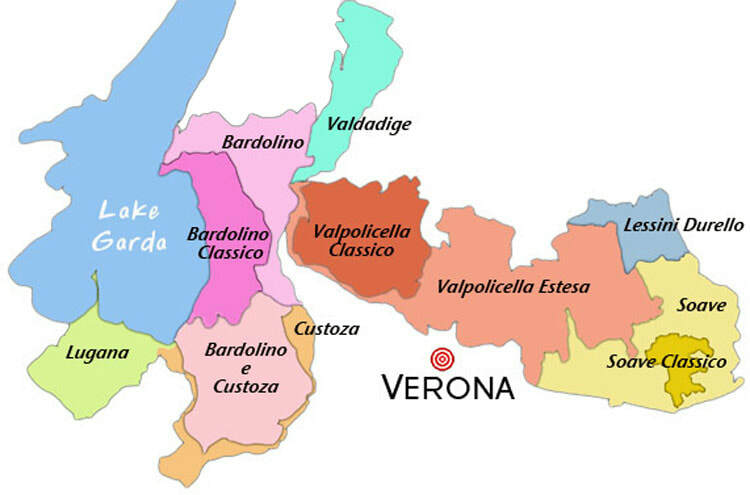 The territories surrounding Verona are famous for such wines as Amarone, a Valpolicella blend typically made from Corvina, Rondinella and Molinara grapes and Soave, a white wine made with Garganega grapes. 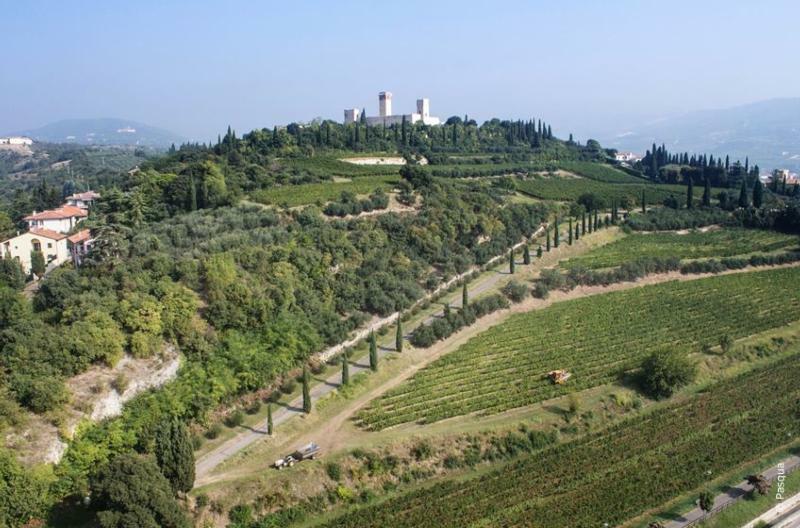 Pasqua has complete control over 741 acres of vineyards (1/3 is estate-owned) spread out from Lake Garda to Soave, with many of Pasqua’s vineyards located in Valpolicella Estesa. Their newest addition of 25 acres is located in Soave. 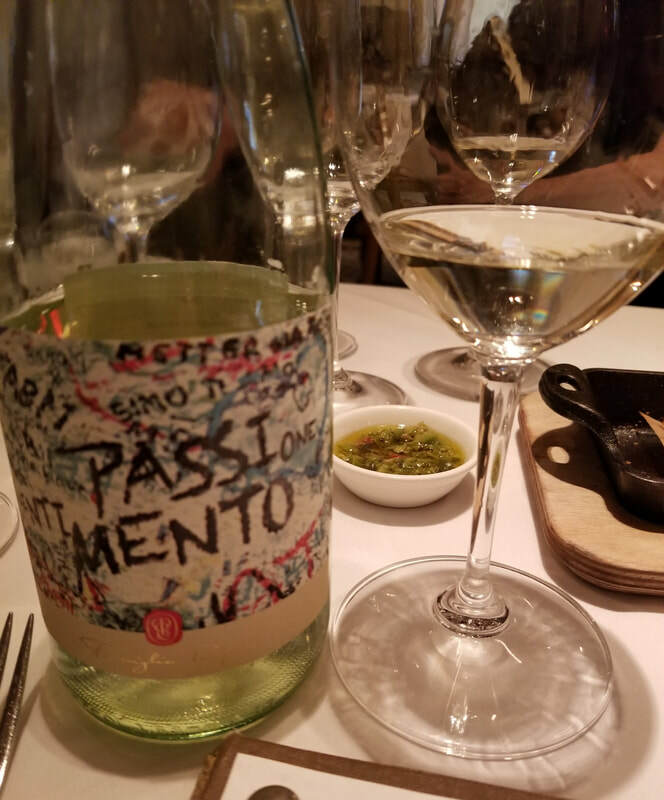 Romeo & Juliet Passione & Sentimento Bianco Veneto IGT 2017 is made with hand-harvested 100% Garganega grapes. The appassimento technique is used to make this wine. Grapes dry in trays for a short time to enhance the sugar and floral aromas prior to maceration and fermentation. Part of the wine is then aged in French oak for a few months and then blended. This is a very aromatic wine with layers of citrus, stone fruit and hints of apricot and perfume on the finish. It is refreshing and crisp. Serve as an aperitif or with cheese, fish, fowl and salads. Romeo & Juliet Passione & Sentimento Rosso Veneto IGT 2016 is made with 100% hand-harvested dried grapes of 40% Merlot, 30% Corvina and 30% Croatina. This is another appassimento-style wine. Grapes are dried for 4 to 6 weeks. The wine is aged for about 3 months in large cherry barrels (second use). The color is ruby with lovely floral, berry and spice aromas. The palate offers cherry, plum and dried fruit and is beautifully balanced with soft tannins and a lingering finish. Serve with hearty cuisine, stews, and aged cheese. 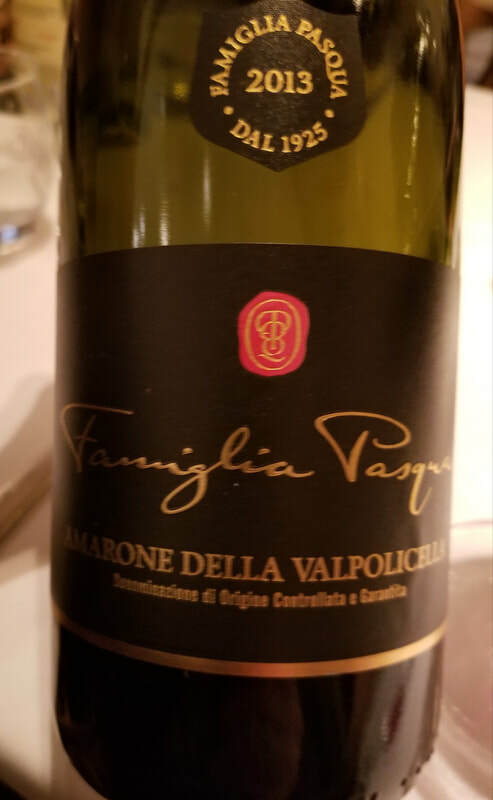 Famiglia Pasqua Amarone della Valpolicella DOCG 2013 is made with hand-harvested Corvina, Rondinella, Corvinone and Negrara grapes. The grapes dry in wooden crates for 4-5 months prior to fermentation. The wine ages in oak barrels for 18-20 months and then an additional 3-4 months aging in bottle. This is a seductive wine with rich aromas of dark berries, chocolate, vanilla and spice. The palate is layered with blackberry, cherry, fennel, spice and hints of earth. This is a beautiful blend of acidity and natural sweetness. Dark berries continue on a long finish. This is a full-bodied wine with silky tannins. Pair with grilled meats, game, hearty stews and hard cheese. The grapes for the Mai Dire Mai wines are sourced from Pasqua’s single vineyard, Montevegro, a 23-hectare vineyard located at an altitude of 350 meters, with basalt and calcareous soil, providing optimal mineral content. 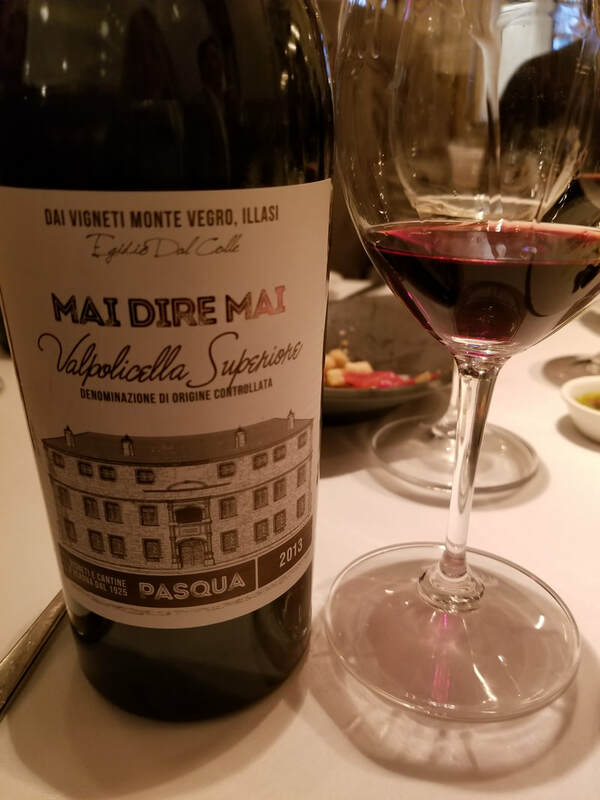 Mai Dire Mai Valpolicella Superiore DOC 2013 is made with 50% Corvina, 30% Corvinone, 10% Rondinella and 10% Oseleta. Grapes are hand-harvested from a single vineyard. The vines are a mixture of new and 40+ years old vines and the limestone in the soil gives this wine its mouthwatering acidity. The wine is aged in French oak tonneaux and barriques for 18 months, (70% new oak and 30% second use.) This is an elegant wine with a ruby red color and lush aromas of dried fruit, cherry, tobacco and spice. The palate offers savory notes of dark dried cherry, clove and espresso. The balance is perfection between the acidity and tannins. The finish is long and the subtly is heavenly. Serve with meats, pasta, firm fish and stews. Mai Dire Mai Amarone della Valpolicella DOCG 2011 is made with 65% Corvina, 15% Corvinone, 10% Rondinella and 10% Oseleta. The grapes are hand-harvested and dried in crates for 4 months. The wine is aged in new French oak casks (70% 225 liters and 30% 500 liters) for 24 months. This is a decadent and sumptuous Amarone. Riccardo said it perfectly, “it is elegant, versatile and dry to the bone”. Intense aromas of dark plum, cherry, earth and spice set the stage. The wine is full-bodied and complex with the palate offering layers of dark fruit, dried cherry, cloves, dark chocolate and hints of spice. This is a well-balanced wine with silky tannins and a lot of finesse. Pair with pasta, meat, aged cheese and dark chocolate. All of the wines that I tasted are expressive of the terroir and demonstrate the family’s desire to bring back “old school style” wines in addition to being adventurous! 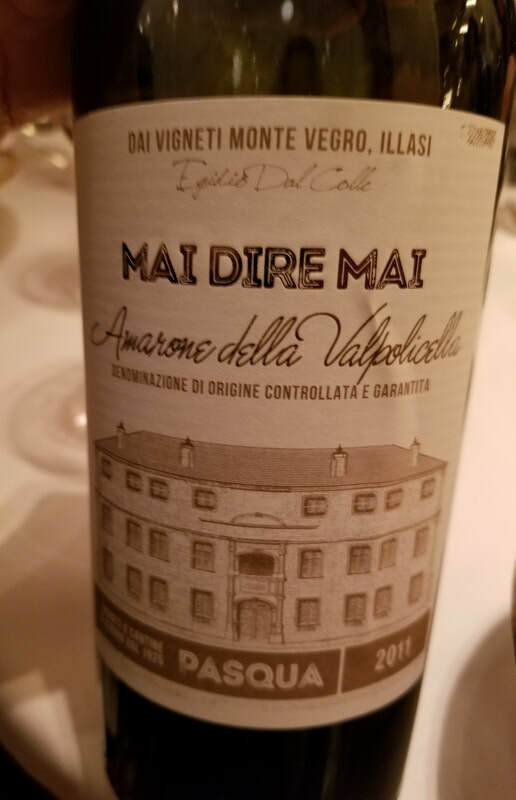 Riccardo said, “we want to start a new trend for Amarone and put Valpolicella back on the map, old style. We have the terroir and time to develop, no matter how long it takes”. As the luncheon drew to a close, Riccardo hinted of a “secret project” that they are working on. Hmmm…I can’t wait to find out! The Pasqua family definitely thinks outside the box and I’m sure whatever they are working on, it will be impressive.